There are several examples in Suffolk of two churches sharing a churchyard. That is not the case here, but just a field separates this church from that of St Mary, Clopton, and the two churches, of similar construction, appear like twins on the Grundisburgh to Otley road. St Botolph, Burgh, sits on a little mound, suggesting an ancient foundation. In fact, there may be more to it than that, and the probably ancient dedication of the church is well-founded. Although early antiquarians identified this as the site of the Roman Combretonium, I believe that today Coddenham, six miles or so to the west, is generally felt to be the actual site. Indeed, Dr Sam Newton, the author of The Origins of Beowulf, argues that this site here at Burgh has far greater significance as an earlier double-ramparted Iron Age enclosure which, despite the traces of some Roman remains, appears not to have been settled significantly in the early centuries of the first Christian millennium. The hill apparently had a strange reputation as the home of a demon fond of water - the name of nearby Grundisburgh may be connected with the Anglo-Saxon word Grendel, the marsh-dwelling monster of Beowulf. As late as the 7th century, an attempt was made to exorcise this demon. St Botolph, who had landed in England and established his monastery at Iken, near Snape, his Icenho, had died, and his bones were brought here. Sam Newton argues that his reputation as an exorcist of marsh monsters might encourage the locals to overcome their fear of the site. The body was translated some fifty years later to Bury Abbey, and then desecrated at the Reformation. You can read more about this, and see a rather dramatic aerial photo of Burgh, on Sam's website. 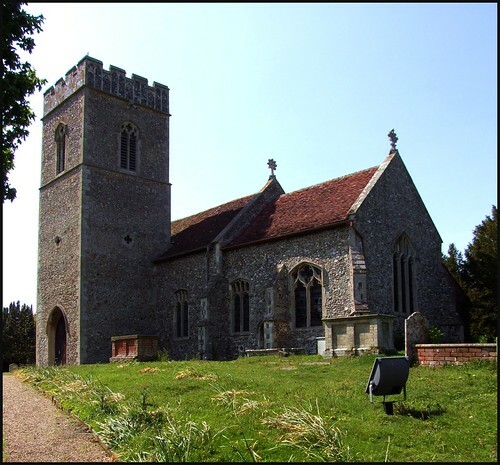 There is a fairly steep climb up to the south side, but this is a rewarding walk, because the church is set in one of the most interesting small graveyards in Suffolk, even without the presence of St Botolph. Unfortunately, some of the stones on the south side have been laid flat, a practice which will inevitably result in their destruction, although at least here the turf has been cleared around each stone to protect it from the lawnmowers. The entire southern side is a vast rabbit warren - you wouldn't get much rest if you were lying here. Sam Newton tells a fascinating story about a poacher supposedly discovering a mysterious carved stone here at some time in the past. There are a couple of fascinating older graves to the east of the chancel. One is a low tomb chest enclosed in a spiked cage, presumably to dissuade body snatchers. The other is a delightful stone, perhaps for a previous Sexton; the tools of his trade are shown at the top of it, his spade, pick and coffin. Also, a snake with its tail in its mouth, as a symbol of eternity; and an hour glass to remind us as we stand and look at it that we, too, will come to this. The first couple of times I visited this church I found it locked, with no evidence of any keyholder, or even of much life. How different things are today! St Botolph is militantly open and welcoming, every day. And this is good, because it has one of the best collections of glass by the Kempe workshop anywhere in Suffolk. Rushing in to this feast of Kempe, you might not notice one of the oldest door handles in East Anglia, a big, confident 13th Century iron ring on a domed plate. Extraordinary to think it has been doing the same job for more than seven hundred years. Other medieval survivals include the 15th Century font, which, although recut, includes some interesting images, including an angel holding a seamless garment. A couple of windows that do not contain Kempe glass are interesting because their designs are not only good, but early, from the 1840s. The best is an absolutely delightful image of Christ as the Good Shepherd. A delicious Art Nouveau memorial to a former Rector is another artistic highlight. Unusually, Burgh retains Rolls of Honour for both the First and Second World Wars. As almost anywhere in England, more Burgh people fought in World War Two, but fewer died. Even if you know this to be true, it is stark to see it displayed in a finely lettered hand. This is not a big church, and as you might expect there is a downside to all this wonderful rich glass - the inside of the church is rather gloomy. And yet, it is very characterful, even atmospheric - I thought it would be a splendid place to sit out a storm, or to come across in the smoky grey light of a November afternoon.